1. First, each player take turns placing a wall. 2. Then, we take a moment to look at the maze (everyone should have a good view). 3. Finally, we each spin the maze in any direction while the others do not watch. With this approach, no one has any advantage over anyone else…and the game begins on a level playing field. Yay! 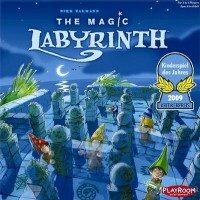 Magic Labyrinth House Rule ~ Everyone places walls and spins the maze! The game includes enough walls to make a very complex maze. It may be tempting to do so, but remember the maze can’t be seen with the board in place. It is a “blind” walk through the labyrinth, and a complex path will create frustration. This is particularly true when children play. A few walls scattered below the board will be challenging enough for most adults.